Welcome to Music Friday when we bring you fabulous songs with jewelry, gemstones or precious metals in the lyrics or title. 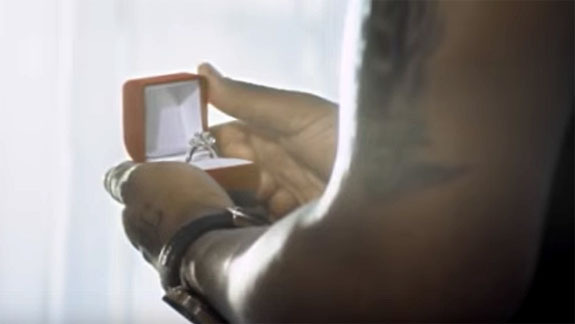 On this first day of April, we shine the spotlight on the month's official birthstone with a song about diamonds — specifically "the perfect diamond ring" in Jason Derulo's "What If." Derulo explained to the BBC that his 2010 song is about meeting someone for the first time and then imagining at that moment how both of their lives may have been profoundly altered. "So I'm telling this girl y'know, what if in two years, three years from now we'll be married with children and living in a log cabin?" he said. He sings, "Yeah, picture me on one knee / With the perfect diamond ring / We just met, but if you said yes / We'd have our wedding on the beach." The official video, which was inspired by the 2004 movie The Butterfly Effect, begins with Derulo and his girlfriend moving in together. He pulls a diamond engagement ring from the nightstand, but hides it in his pocket when she comes into the room. She leaves to retrieve the last box from the moving truck, but while she is walking across the street, a distracted driver nearly hits her. Derulo hears the skidding car and sprints to save his girlfriend, but as he reaches her, the video freezes and then time beings to go in reverse. We learn how Derulo and his girlfriend got to this moment through reverse-motion flashbacks, as if their lives are being rewound. The video, which has been viewed nearly 30 million times, contains a surprise ending that we won't spoil here. The "butterfly effect," by the way, is a scientific theory that a single occurrence, no matter how small, can change the course of the universe forever. "What If" is the fourth single from Derulo's self-titled debut album. It was first released in the UK and peaked at #12. The single was subsequently released in the U.S., where it made its debut at #76 on the Billboard Hot 100 chart. Born Jason Joel Desrouleaux in Miramar, Fla., the 26-year-old singer-songwriter-dancer-choreographer, has sold more than 50 million singles since launching his solo career in 2009. He changed his last name to Derulo because the French spelling was hard to pronounce. Written by Jonathan Rotem and Jason Desrouleaux. Performed by Jason Derulo. What if I'm the one for you? And you're the one for me? So I'ma say du, du, du-du, du-du, du-du, baby, what if? We all can say du, du, du-du, du-du, du-du, baby, what if? And, baby, what's the reason we can't fall in love? In November 2015, the 12.03-carat "Blue Moon" set an auction record for the priciest diamond ever when the fancy vivid blue gem sold for $48.5 million at Sotheby's Geneva. But on May 18, the 14.62-carat "Oppenheimer Blue" has a chance to dethrone the Blue Moon when it goes under the hammer at Christie’s Magnificent Jewels sale in Geneva. Oppenheimer Blue, which carries a pre-sale estimate of $38 million to $45 million, is the largest fancy vivid blue diamond ever offered at auction. Some experts believe Christie's high estimate is on the conservative side, giving the stone a viable chance of setting a new record. 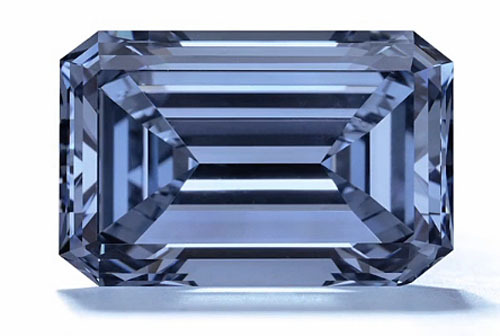 Despite both diamonds being of similar color, the cushion-shaped Blue Moon (now called the Blue Moon of Josephine) was rated internally flawless, while the rectangular-cut Oppenheimer Blue sits one grade below at VVS1 clarity. Even if the Oppenheimer Blue doesn't match Blue Moon's record per-carat selling price of $4.03 million, it could still sell for more because it is 2.59 carats larger. 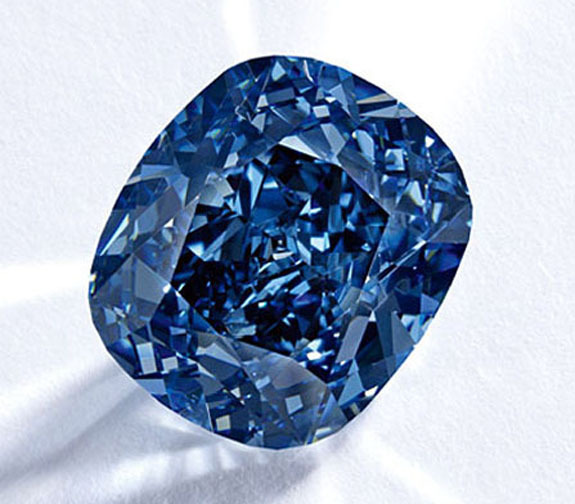 "The Oppenheimer Blue was named in honor of a very special connoisseur — its previous owner, Sir Philip Oppenheimer," noted Rahul Kadakia, Christie's International Head of Jewelry. "The Oppenheimers have been leaders in the diamond industry for generations and Sir Philip could have had any diamond he wanted. But he chose this one, with its perfect hue, impeccable proportions and fabulous rectangular shape." Kadakia called the "Oppenheimer Blue" the "gem of gems" and "one of the rarest gems in the world." In a promotional video, the narrator described the rise in the popularity of blue diamonds. "Blue diamonds have gained a wider following," he said, "not only because they are stunning, but because there are so few of them available in the world." The magnificent gem will be offered for sale in its original platinum mounting by Verdura. The large blue center stone is flanked by two trapeze-shaped white diamonds. Fancy vivid blue diamonds are extraordinarily rare. A Gemological Institute of America study of 462 blue diamonds revealed that only 1% attained the color grade of "fancy vivid." Christie’s Magnificent Jewels sale is scheduled to take place at the Four Seasons Hotel des Bergues on May 18. Images: Oppenheimer Blue courtesy of Christie's. Screen captures via Christies.com. Blue Moon courtesy of Sotheby's. 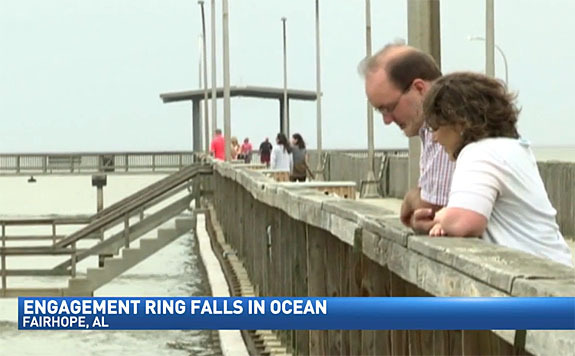 A romantic marriage proposal on a pier overlooking picturesque Mobile Bay turned into a nightmare for an Alabama man who fumbled the ring and helplessly watched it bounce into the water below. 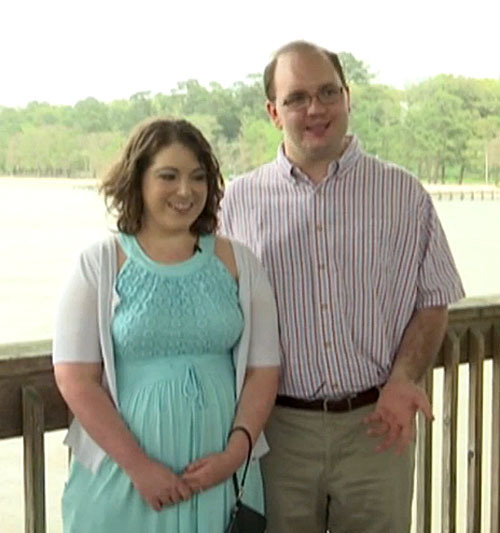 Greg's well-intentioned plan was to share a magical outing with his girlfriend, Sara, on the pier at Fairhope. There, he would surprise her by popping the question. Somehow, Greg never got the memo that diamond engagement rings and large bodies of water do not mix. With a friend capturing the picture-perfect moment with an iPhone, Greg delivered a heartfelt proposal, got down on one knee and presented a ring box that he had hidden in his pocket. All good, so far. Then, he opened the box and watched helplessly as the diamond engagement ring seemed to fly out, bouncing on the wooden decking and then splashing into the bay. The shocked couple can be seen staring into the water. Greg and Sara could hardly believe what had just happened. "We were thinking that we just saw some splash, but that this was not real," Greg told CW 39. The future groom bravely jumped into the water, but had no success locating the uninsured ring. All was not lost, however, as the determined Alabaman escorted Sara back to the jewelry store the very same day. 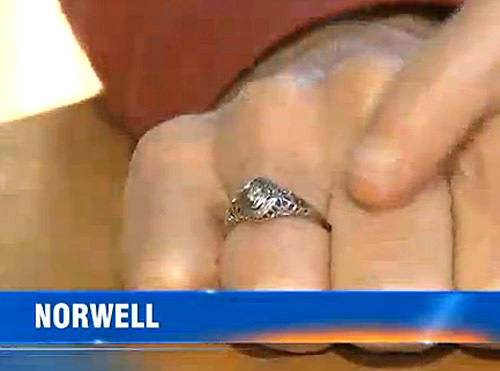 He purchased a replacement ring and proposed right there in the retail establishment. "Then I did something of a quick proposal," Greg told CW 39. "Just asked her if she would marry me in the store." Greg joked that the proposal took place on dry land with no water nearby — a hard lesson learned. Credits: Video screen captures via cw39.com. 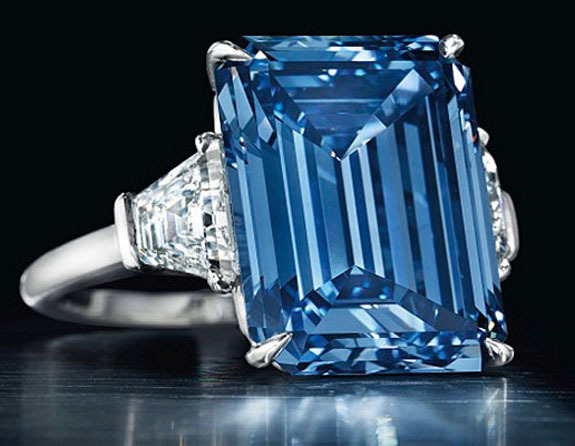 Jewelry buffs will remember the spring of 2016 as the "season of sensational blue diamonds." In a span of just six weeks, three museum-quality blue diamonds — all larger than 9.5 carats and each carrying a price tag of $25 million or more — will be making headlines around the world. Yesterday. The first of the three, the 10.10-carat "De Beers Millennium Jewel 4," set an Asian auction record at Sotheby's Hong Kong yesterday. The $32 million selling price broke the record for the most expensive piece of jewelry ever sold at auction in Asia. It was scooped up by a phone bidder who chose to remain anonymous. 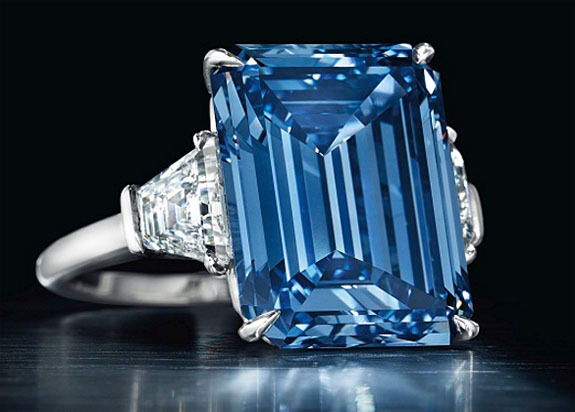 The pre-sale estimate for the fancy vivid blue gem had been $30 to $36 million. Slightly larger than an almond, the internally flawless oval diamond edged out the previous record holder, a 118-carat white diamond that fetched $30.6 million in 2013. The De Beers Millennium Jewel 4 was originally unveiled by De Beers in 2000 as part of the Millennium Jewels Collection. While the priceless grouping was being displayed in London's Millennium Dome, a gang of thieves tried to steal the baubles in a daring raid that included a James-Bond-like escape down the Thames in a speedboat. Metropolitan Police foiled the heist and the bad guys were jailed for up to 18 years each. Three superior blue gems appearing in one season is significant because gem experts believe that there are no more than a dozen or so fancy vivid blue diamonds over 10 carats in the world. April 19. Next up in this spring's cavalcade of diamond delights will be the "Shirley Temple Blue," a gorgeous 9.54-carat fancy deep blue diamond ring purchased for the child star by her father in 1940. The cushion-cut diamond in its original Art Deco-inspired setting is expected to sell for $25 million to $35 million when it hits the auction block at Sotheby’s New York on April 19. The “Shirley Temple Blue” carries a clarity grade of VVS2 and was rated “potentially internally flawless.” George Francis Temple paid $7,210 for the ring 76 years ago. May 18. Next month at Christie's Geneva, the 14.62-carat rectangular-cut "Oppenheimer Blue" has a chance to surpass the record $48.5 million paid at Sotheby’s Geneva for the 12.03-carat cushion-shaped internally flawless “Blue Moon” (now called “Blue Moon of Josephine”). “Blue Moon” is the record holder for the highest price ever paid for a diamond of any color, and for the highest price paid per carat for any diamond ($4.02 million). The Oppenheimer Blue, which boasts a VVS1 clarity, carries a pre-sale estimate of $38 million to $45 million and is the largest fancy vivid blue diamond ever offered at auction. Some experts believe Christie’s high estimate is on the conservative side, so the Blue Moon's record could be within reach. Images: Courtesy of Sotheby’s; courtesy of Christie's. 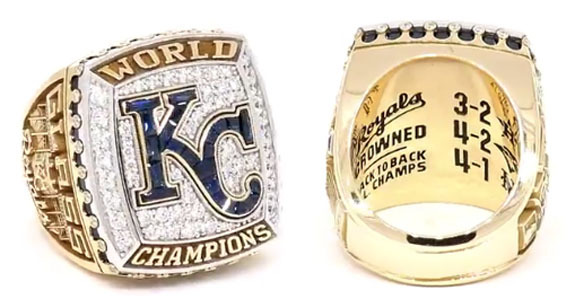 The Kansas City Royals celebrated their 2015 World Series championship on Tuesday with dazzling rings that signal a return to yellow gold. The ring ceremony took place at Kauffman Stadium prior to their contest against the New York Mets, the same team they vanquished last October in a series of thrilling come-from-behind victories. The spectacular rings by Jostens feature a combination of 2.5 carats of white diamonds and 7 carats of blue sapphires set in a two-tone display of white and yellow 14-karat gold. A representative from Jostens noted that it's been nearly a decade since a World Series ring has been designed in yellow gold. The last ones were worn by the 2006 St. Louis Cardinals. The KC logo on the top of the ring is masterfully created from custom-cut blue sapphires surrounded by a yellow gold outline placed atop a field of 14-karat white gold and brilliant round diamonds. The words "WORLD" and "CHAMPIONS" edge the top and bottom of the ring in yellow gold. Reaching up from the sides of the ring and framing the top is a crown motif that mimics the team's iconic logo. A row of blue sapphires sits behind the crown, which is adorned with 30 round white diamonds. One side of the ring features the player's name atop a silhouetted image of Kauffman Stadium overlaid with the Royals' script logo. The opposite side features the championship year 2015 set in white diamonds and placed above a baseball diamond that surrounds a silhouette of the World Series trophy. The trophy sits atop five round diamonds representing the five runs the Royals scored in the top of the 12th inning of the series-clinching Game 5. First and third bases are shown set with two blue princess-cut sapphires representing the team's back-to-back World Series appearances in 2014 and 2015. "Today is a special celebration for the entire Royals organization and our fans as we honor the 2015 Kansas City Royals with the presentation of their World Series Championship rings," said Royals president Dan Glass. 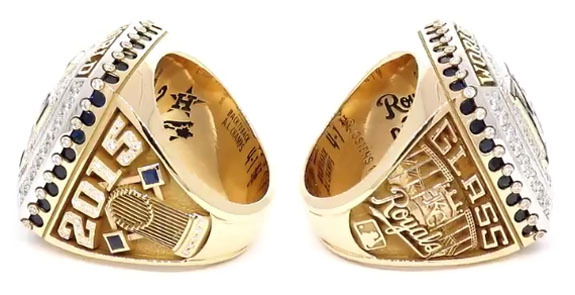 "These brilliant rings embody the sacrifices and contributions made by the entire Royals organization to become the 2015 World Series Champions. It is an honor to present this highest reward to our players, coaches and staff members." 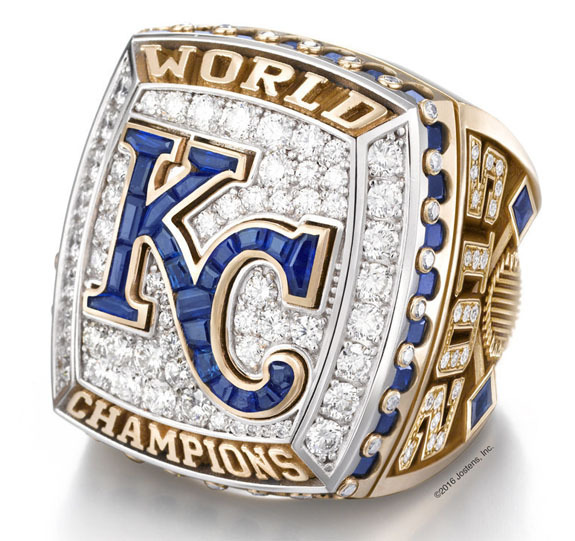 The Royals will be giving out about 700 rings in total. That numbers includes players, coaches, field staff, full-time front office members, scouts and minor-league instructors. Credits: Images courtesy of Jostens; Screen captures via Twitter.com/Royals. Welcome to Music Friday when we often bring your classic songs with jewelry, gemstones or precious metals in the title or lyrics. Today, the incomparable Carole King gets the ring in her classic 1964 hit, "Oh No Not My Baby." In this song about a young woman faced with allegations of a cheating boyfriend, King's trust in him is unwavering. She sings, "When my friends told me you had someone new / I didn't believe a single word was true." Later in the song, King rationalizes that even if her boyfriend was unfaithful, the dalliance was probably just a flash in the pan. Once again, she sings, "Well, you might have had a last minute fling / But I am sure it didn't mean a thing / 'Cause yesterday you gave me your ring." Co-written by King and then-husband Gerry Goffin, "Oh No Not My Baby" was originally recorded in 1964 by Maxine Brown and subsequently covered by some of the biggest names in the music business, including Aretha Franklin, Cher, Rod Stewart, Linda Ronstadt, the Shirelles, Manfred Mann, Dusty Springfield, Debby Boone, Julie Budd, Eydie Gormé and The 1970s made-for-TV band The Partridge Family. Fans of American Idol might remember Jacob Lusk's rendition of the song in 2011. 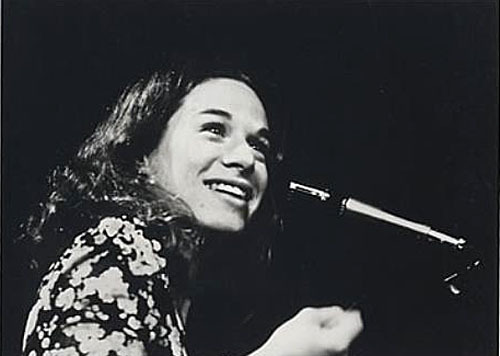 Although Carole King has composed most of her songs for other performers, many fans agree that nobody does Carole King like Carole King. That's why we chose to feature King's rendition of "Oh No Not My Baby," which appeared on her 1980 album Pearls: Songs of Goffin and King as well as her 2001 album Love Makes the World. Born Carol Joan Klein to a New York City firefighter dad and teacher mom, King started playing the piano at the age of 4. While attending high school she dated Neil Sedaka and changed her name to Carole King. She and her buddy Paul Simon made extra money by making demo records for $25 per session. While attending Queens College, she met Goffin, who became her song-writing partner. They were married one year later, in 1959, when King was only 17 years old. The marriage lasted nine years. In the early 1970s, King launched a successful solo career catapulted by the immense success of Tapestry, a breakthrough album that topped the U.S. album charts for 15 weeks in 1971 and remained on the charts for more than six years. King is credited with writing or co-writing 118 songs that have appeared on the Billboard Hot 100. King was inducted into the Rock and Roll Hall of Fame in 1990 and into the Songwriters' Hall of Fame in 1987. King announced her retirement from songwriting and performing in 2012, but then walked back that statement in 2013, clarifying that she was just "taking a break." She is now 74 years old. Check out the audio track of King's awesome rendition of "Oh No Not My Baby." The lyrics are below if you'd like to sing along. "Oh No Not My Baby"
Written by Carole King and Gerry Goffin. Performed by Carole King. Credits: Promotional image via Epic Records. Tapestry album cover. The largest pear-shaped fancy vivid pink diamond ever offered at auction is expected to fetch upwards of $38 million when it headlines Sotheby's Geneva sale in May. Known as the "Unique Pink," the 15.38-carat gemstone's impressive size, superb color and stunning clarity puts it in the top echelon of the finest pink diamonds of all time. "It is difficult to imagine a diamond that better illustrates the term 'vivid pink' than this outstanding stone," noted David Bennett, Worldwide Chairman of Sotheby's International Jewelry Division. "The color is simply astonishing and, for its size, it is in my experience truly unique." The record for the highest price ever paid at auction for a fancy vivid pink diamond is currently held by the 24.78-carat emerald-cut "Graff Pink," which was sold by British billionaire Laurence Graff for $46.2 million at Sotheby's Geneva in 2010. 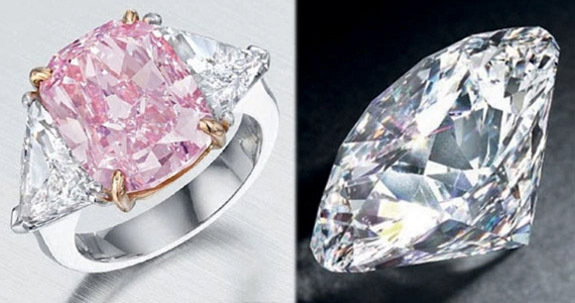 Although the Unique Pink is expected to yield a $8 million less than the Graff Pink, it should outperform the highly acclaimed “Sweet Josephine,” a cushion-shaped fancy vivid pink diamond weighing 16.08 carats that was purchased by Hong Kong billionaire Joseph Lau for $28.5 million at Christie’s Geneva in 2015. 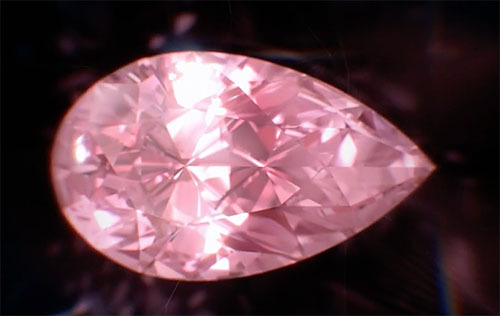 In addition to receiving the Gemological Institute of America's highest possible color grading, the Unique Pink also earned a Type IIa rating, reflecting its "exceedingly pure structure." Pink diamonds are also extraordinarily rare. The GIA reports that of all the diamonds submitted for grading each year, only 3% are colored diamonds. Of that grouping, only 5% are predominantly pink. Because of this rarity, wealthy investors have sought pink diamonds for their portfolios. According to the Fancy Color Research Foundation, since January 2005, pink diamonds have risen in value by more than 350%. Over that same period, gold, by comparison, has risen by just over 160% and the S&P 500 gained 66%. 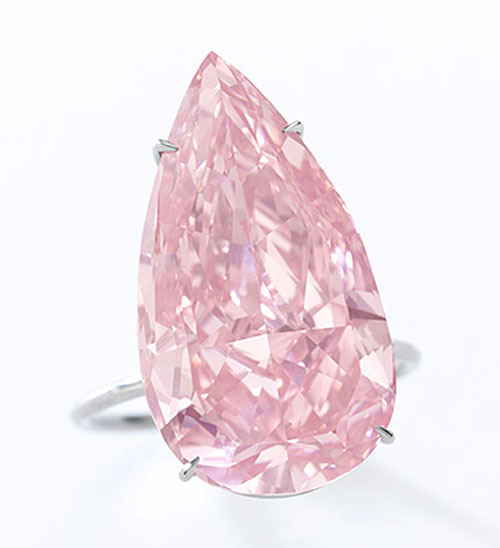 Sotheby's set the pre-sale estimate for the Unique Pink at $28 million to $38 million. It will be the top lot of the auction house's Magnificent Jewels and Noble Jewels sale, which is set to take place on May 17 in Geneva. The Unique Pink already has completed two legs of a three-city promotional tour that included Hong Kong and London. The gem will appear in New York from April 15-19. Credits: Photo courtesy of Sotheby’s; screen capture via Sothebys.com. 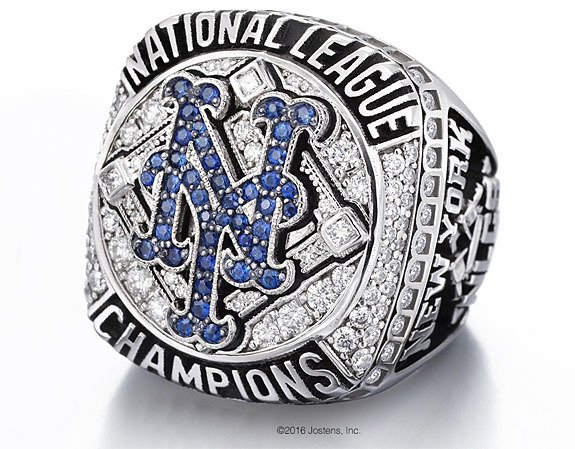 The defending National League Champion New York Mets returned to Citi Field on Thursday to host their home opener and to claim the spoils of their unlikely run to the 2015 World Series — impressive white gold rings featuring 110 diamonds and 42 blue sapphires. Even though they eventually fell to the Kansas City Royals in five games, the Mets were proud of a season that saw the team go on a late-season surge to overtake the Washington Nationals to win the East Division, and then knock out the Los Angeles Dodgers and Chicago Cubs in the playoffs. Created by Jostens, the 10-karat white gold National League Championship rings feature the team's iconic NY logo fashioned from 42 round sapphires. The logo is set atop an infield base path surrounded by a field of pavé-set diamonds. The words "NATIONAL LEAGUE" and "CHAMPIONS" surround the top and bottom of the ring in raised white gold against a black ground. In all, the ring has a total gem weight of 2.75 carats. "[The] guys were excited to get the rings," manager Terry Collins said. "That's what you play for. I know these guys are getting paid and they're getting paid a lot of money, but when you can win a ring, that means it's extra special." Mets team captain David Wright noted that although a second-place ring is nice, the real goal is capturing a World Series ring. "I think all of us will wear that proudly,” Wright said. “At the same time, it’s time to move on. We want that first place ring, so I think it kind of reminds you that there is still work to be done." Adorning both sides of the players' rings are the iconic arches of Citi Field, which are patterned after the brick exterior of historic Ebbets Field, where the Brooklyn Dodgers played from 1913 to 1957. One side of the ring features the player's name above a silhouette of the New York skyline, overlaid with the Mets script logo that sits atop an image of the Brooklyn Bridge. The player's number is featured below the bridge. The other side features the National League Championship Series (NLCS) logo and the Major League Baseball logo surrounded by the words "NEW YORK" and the championship year 2015. The inside of the ring is inscribed with the years of the Mets' five National League championships (1969, 1973, 1986, 2000 and 2015) set next to a silhouette of the Warren C. Giles National League Trophy with NEW YORK etched above the trophy. About 750 people in the Mets organization received a National League Championship ring. Notably absent from that group was Steven Boldis, the long-time Mets mascot, Mr. Met. Boldis, who has worn the mascot costume for 15 years, was publicly miffed by the snub. The New York Daily News reported that the Mets organization denied the ring because the mascot worked only half of the minimum number of hours to qualify. On May 29, the first 15,000 fans to arrive at Citi Field will receive a replica of the Mets' 1986 World Series ring. Credits: Ring photos courtesy of Jostens. Mr. Met photo via Facebook/New York Mets. The average amount spent on an engagement ring in the U.S. edged up to $5,871 in 2015, according to The Knot's ninth annual Real Weddings Study. That number rose only a touch from 2014's average cost of $5,855. 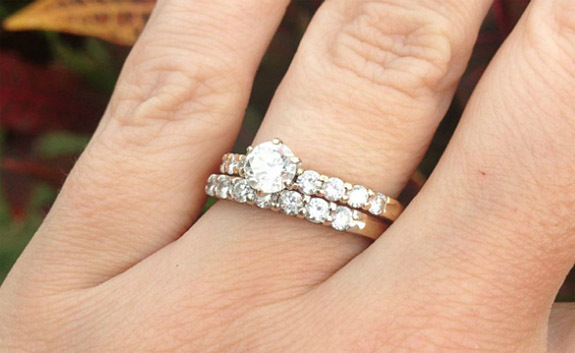 The engagement ring is the second-highest-priced item on an average couple's list of wedding expenses. Only the reception venue, at $14,788, rated higher. The Knot reported that weddings continue to be one of the most important — and most expensive — events in couples' lives. 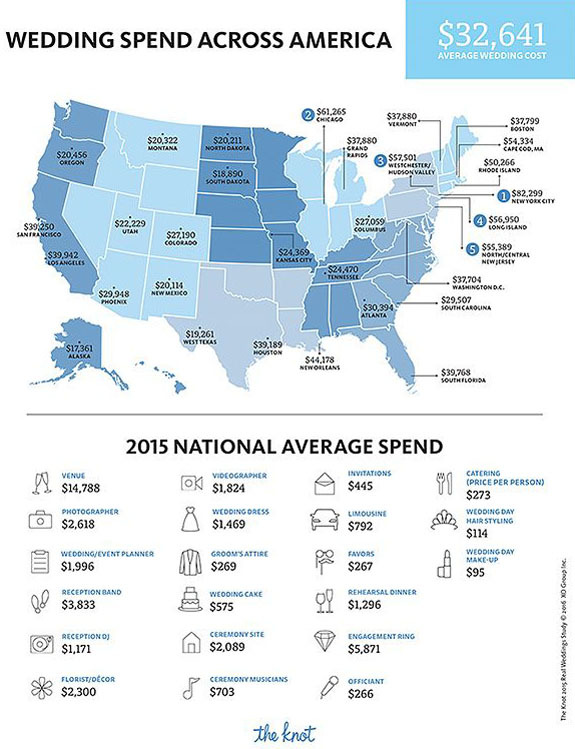 Overall, brides and grooms spent $32,641 on their weddings in 2015, and that tally doesn't include the honeymoon. The cost of the average wedding is up about $1,400 compared to last year and by more than $5,500 over the past five years. That increase was driven by a number of key categories: reception venue (+$1,950), ceremony site (+$652) and reception band (+$545). • The most expensive place to get married is Manhattan ($82,299), while the least expensive is Alaska ($17,361). • The most popular month to get engaged is December (16%). • The average length of an engagement is 14.5 months. • The most popular months to get married are October (17%) and September (15%). • The average marrying age of the bride is 29 and the groom is 31. • Manhattan has the oldest brides (32.8 years) and the oldest grooms (35.4 years). • On average, the bride's parents contribute 44% of the overall wedding budget, while the bride and groom contribute 43% and the groom's parents pitch in 12%. "Others" account for 1% of the budget. • The average number of guests at a wedding is 139, down from 149 in 2009. • The average cost per wedding guest is $237, up from $194 in 2009. • 40% of couples had a family member or friend officiate their ceremony, compared to 29% in 2009. Here are the average costs of key bridal services: reception band ($3,833), photographer ($2,618), florist/décor ($2,300), ceremony site ($2,089), wedding/event planner ($1,996), videographer ($1,824), wedding dress ($1,469), rehearsal dinner ($1,296), reception DJ ($1,171), transportation ($792), ceremony musicians ($703), wedding cake ($575), invitations ($445), groom's attire and accessories ($269), favors ($267), officiant ($266), wedding day hair styling ($114) and wedding day make-up ($95). The popular wedding planning website also revealed that couples are using their mobile devices to find the vendors who will create their perfect event. Exactly 89% of couples reported using their smartphones to help plan their wedding. The 2015 Real Weddings Survey captured responses from nearly 18,000 U.S. brides and grooms married between January 1 and December 31, 2015. Credits: Bridal couple shot via BigStockPhoto.com; Infographic courtesy of The Knot. 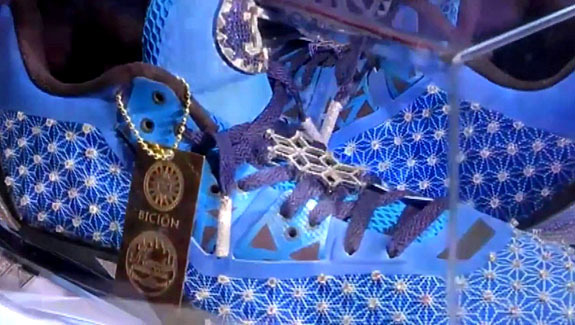 Encrusted with hundreds of carats of white diamonds and blue sapphires, this $4 million pair of customized Li-Ning Way of Wade 4s are the most expensive sneakers in the world. Dan Gamache of Mache Custom Kicks collaborated with luxury lifestyle brand Bicion to design this one-of-a-kind footwear fantasy that will be auctioned to raise money for Soles4Souls. Since 2006, the charity has donated 26 million pairs of shoes and sneakers to underprivileged children in 127 countries. Named after Miami Heat superstar Dwyane Wade, the shoes feature diamonds and sapphires set in 18-karat gold on the back heel logo, tongue logo and midsole. They even come with a solid gold hang tag and a custom display case with an 18-karat gold base and LED lighting. 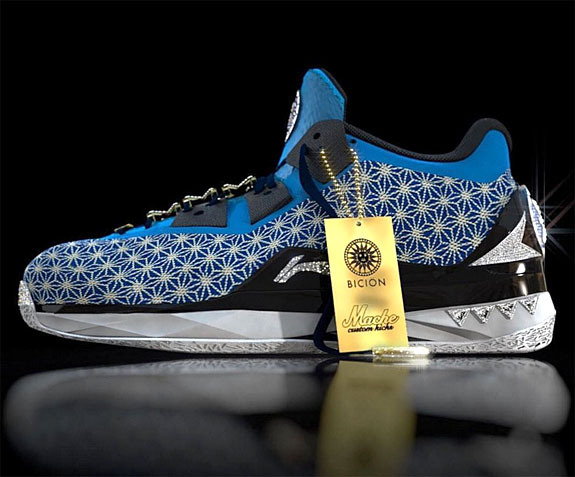 The customized Way of Wade sneakers have been dubbed "The Fire Monkey," a tribute to the Chinese Year of the Monkey, a year that represents prosperity, new business ventures and ambition. In Chinese tradition, the lucky monkey hails the chrysanthemum as its flower of choice. The custom sneakers incorporate a gemstone-adorned flower pattern reminiscent of the chrysanthemum. "In a time when celebrities have increasing power, the fact that the Bicion team has chosen to put that influence to good use is amazing," Soles4Souls CEO Buddy Teaster told popsugar.com. "Their donation to Soles4Souls will literally put shoes on the feet of hundreds of thousands of people in the year ahead." "Doing custom sneakers for what seems like forever, it always seems hard to top the last project," Gamache said about his partnership with Bicion. "This is something different, something special. To have the opportunity to design and create the most expensive sneaker in the world is a humbling opportunity. But to know that this sneaker will help put shoes on children's feet across the globe is an amazing feeling. It makes my work and everything I have ever done worth it." Images via Bicion; YouTube screen captures. Welcome to Music Friday when we bring you great songs with jewelry, gemstones or precious metals in the title or lyrics. 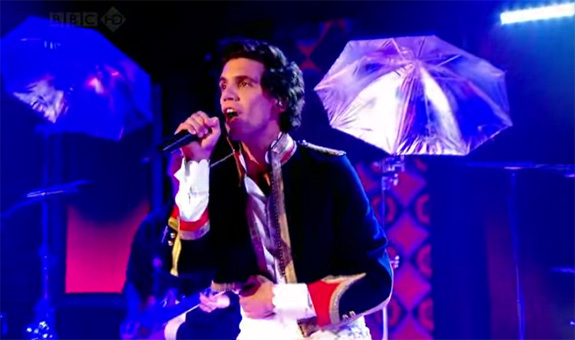 Today, English singer Mika performs his uplifting 2009 teenage anthem, "We Are Golden," a celebration of youth that encourages young people to dream big and acknowledge how awesome they are. Mika told The Daily Mail how the song came together. "I lost myself in a teenage world," he said. "[The song is] about trying to convince yourself that you're special." He also revealed to The Sun that the song was inspired his own experiences of being bullied in school. "I was thinking how things were as a teenager," he said. "I worried about surviving into my 20s. That song is dark but it's also saying, 'I'm going to survive.'" Mika chants, "We are not what you think we are / We are golden, we are golden / We are not what you think we are / We are golden, we are golden." The terms "we are gold" and "we are golden" come up frequently in popular music. Because of the precious metal's impressive characteristics, songwriters use "gold" as a metaphor for someone or something that is untarnished or pure. Music buffs may remember Joni Mitchell using this phrase in "Woodstock," her 1970 classic. She sings, "We are stardust / We are golden / And we've got to get ourselves / Back to the garden." The garden, in this case, is symbolically the Garden of Eden. "We Are Golden" was released as the first single from Mika's second studio album, The Boy Who Knew Too Much. The song charted in more than 20 countries and was featured in TeenNick promos during the fall of 2009. It was also used as the theme song for Fox's broadcast of the 2009 Teen Choice Awards. 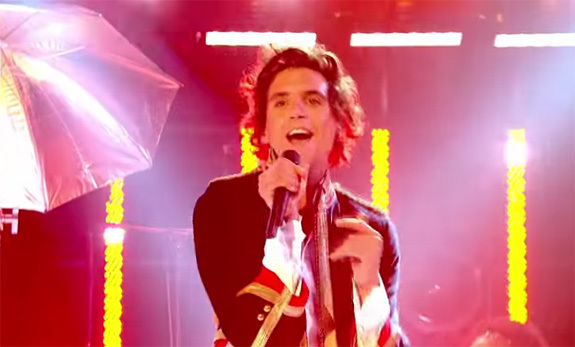 Born Michael Holbrook Penniman, Jr., the 32-year-old British singer/songwriter stylized his name as MIKA. He got his big break in 2007 when he was named the #1 breakthrough act in a BBC poll of music critics. Written and performed by Mika. Do you still think that you know? 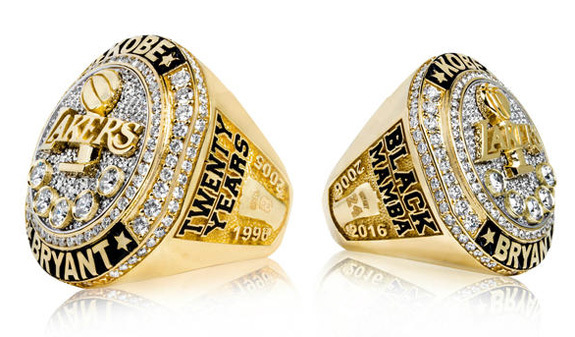 Kobe Bryant added another diamond ring to his collection of Lakers bling. Before his final game as an NBA player, Lakers owner and president Jeanie Buss presented the 20-year superstar with a dazzling diamond retirement ring in a private ceremony with his wife, Vanessa — who received a matching ring — and their daughters, Gianna and Natalia. Bryant, in true Hollywood style, scored an astounding 60 points in his final contest. According to a Lakers press release, the ring was designed by renown jeweler Jason of Beverly Hills and features round white diamonds with a total carat weight of 4.87 carats set into 70 grams of 14-karat yellow and white gold. On the sides are Bryant’s two jersey numbers and his nickname “Black Mamba” with a swirl of black snakeskin. 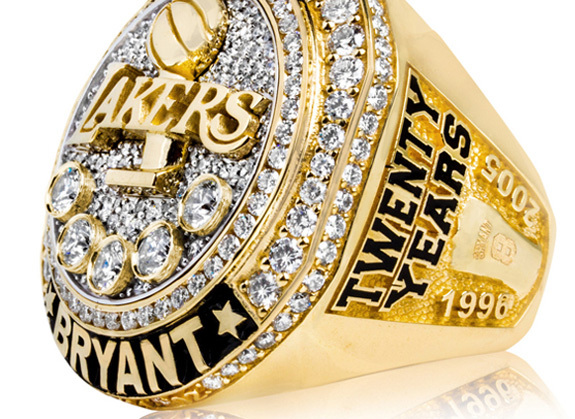 Between his first and last names on the front of the ring are 20 diamonds representing every season Bryant spent with the Lakers. The top depicts the Larry O'Brien championship trophy and five larger diamonds for each title won. On one side, "TWENTY YEARS" sits above a No. 8 Lakers jersey along with the years 1996 and 2005, the timeframe during which it was worn. The other side features a No. 24 jersey and the years 2006 and 2016. Bryant remarked, "Wow, are you kidding me?" while opening the ring box. Buss' brother and Lakers co-owner, Jesse Buss, honored Bryant on Facebook with a heartfelt tribute. Reflecting on his youth, Buss recalled a family trip to the beach when he was 8 years old. His dad, then-owner Jerry Buss, was walking to and from telephones talking to then-general manager Jerry West, who was raving about a draft prospect named Kobe Bryant. When he returned to his family, Jerry Buss told them, "There's this kid, Kobe, who is going to be the next great player, and I think we can get him." “At the time, I didn't realize what the business of the NBA really meant, or how teams were put together, so it didn't really dawn on me how much this would mean for the @lakers," Jesse Buss wrote. "I can tell you now that watching Kobe play for the last 20 years has been nothing but jaw-dropping and inspiring to me, and to so many basketball fans around the world and especially amongst the Purple and Gold. I'm thankful for everything Kobe brought to our beloved franchise and to the game of basketball... The one thing that saddens me is that I wish my Dad was here for this moment, and that he could give Kobe one last hug on his way off the court. 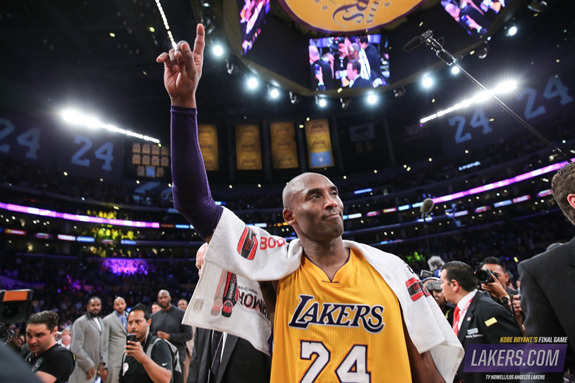 I hope he leaves the game with no regrets, and truly from the bottom of our hearts: THANK YOU KOBE! We all love you. #kb20 #lakers"
Credits: Lakers.com; Jason of Beverly Hills. 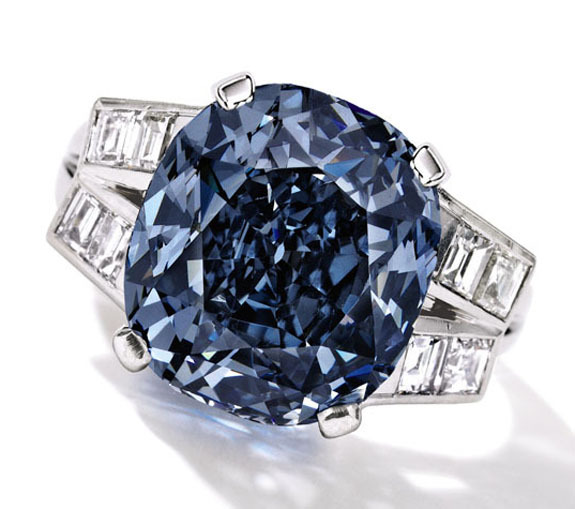 Shirley Temple's 9.54-carat blue diamond ring was billed as the star of Sotheby's New York auction on Tuesday, but went unsold when the bidding stalled at $22 million, short of the reserve price and well below the high estimate of $35 million. 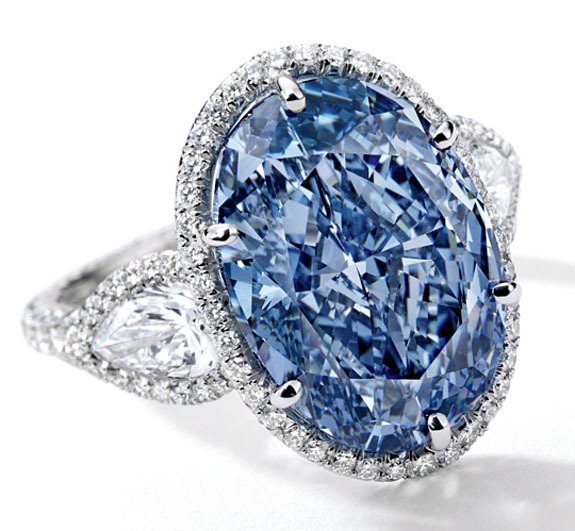 "The Shirley Temple Blue Diamond is an exceptional stone in quality, rarity and provenance. It has been an honor to share its story with collectors, connoisseurs and Temple's loyal fans over the past few months," Sotheby's noted a statement. "Unfortunately, tonight wasn't its night in the salesroom, but we remain fully confident that it will find a buyer." Temple was nearly 12 years old and had just wrapped up her new film, The Blue Bird, when her father, George Francis, surprised the box office phenomenon with a cushion-cut fancy deep blue diamond in an Art Deco-inspired platinum setting. George Francis paid $7,210 for the ring 76 years ago, which is equivalent to about $122,000 today. The diamond had earned a grade of VVS2 and was presented at the auction in its original platinum setting. As an adult, Shirley Temple Black became a diplomat, serving as a United Nations delegate, U.S. Ambassador to Ghana and later as the U.S. Ambassador to Czechoslovakia. She reportedly wore her blue diamond ring throughout her life. She died in February of 2014 at that age of 85. The poor showing for Temple's blue diamond came only two weeks after the slightly larger and internally flawless 10.10-carat “De Beers Millennium Jewel 4” set an Asian auction record at Sotheby’s Hong Kong when it sold for $32 million. 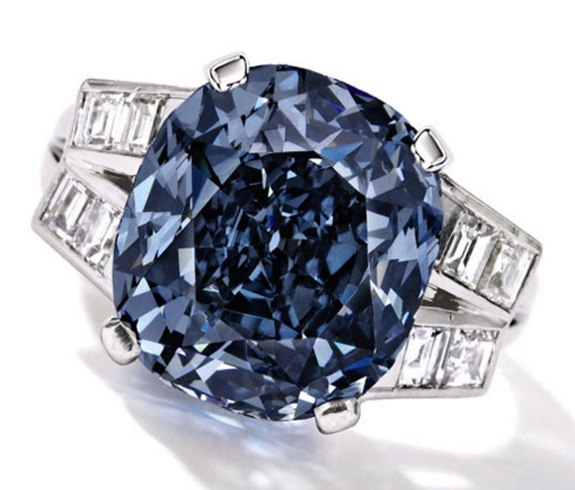 The pre-sale estimate for the fancy vivid blue gem had been $30 to $36 million. On May 18 at Christie’s Geneva, the 14.62-carat rectangular-cut “Oppenheimer Blue” has a chance to set a new record for the highest price ever paid for a diamond of any color. 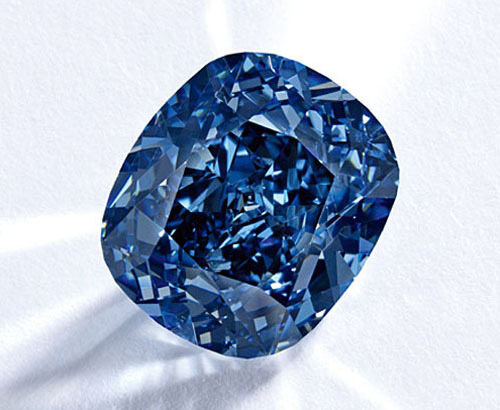 The current record of $48.5 million is held by the 12.03-carat cushion-shaped internally flawless “Blue Moon” (now called “Blue Moon of Josephine”). The Oppenheimer Blue boasts a VVS1 clarity and is the largest fancy vivid blue diamond ever offered at auction. Images courtesy of Sotheby’s. 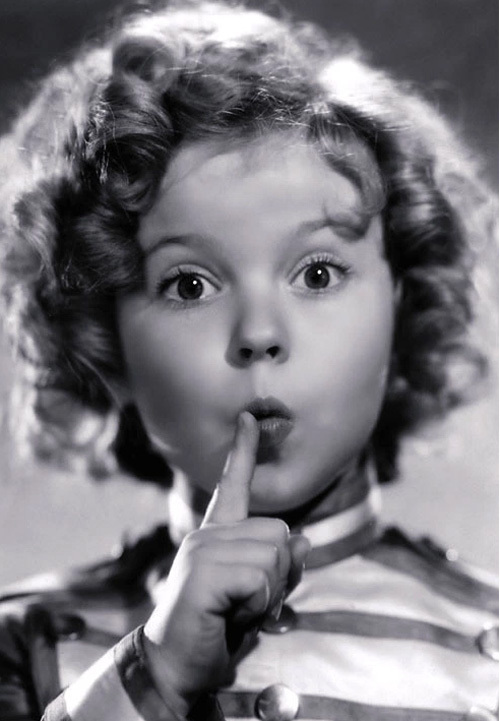 Shirley Temple promo shot ©20thCentFox/Courtesy Everett Collection. Welcome to Music Friday when we bring you fun songs with jewelry, gemstones or precious metals in the title or lyrics. Today, Twenty One Pilots' frontman Tyler Joseph delivers an uplifting tribute to his mom in the 2013 release, "House of Gold." In this song about the fear of aging, Joseph's mom asks her singer/songwriter son if he'll take care of her in her twilight years. Written as an exchange between him and his mom, Joseph sings, "She asked me, 'Son, when I grow old / Will you buy me a house of gold? / And when your father turns to stone / Will you take care of me?'" Joseph responds that he will not only make her the "Queen of everything you see," but he'll also bring her fame and cure her of disease. "House of Gold" is the fourth track of the indie pop group's third studio album, Vessel. 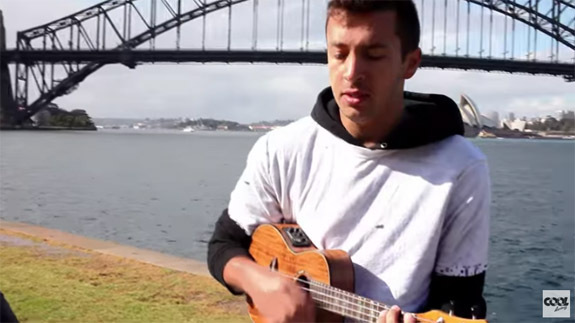 The song, which features Joseph on the ukulele and bandmate Josh Dun on the drums, became a top-10 hit on Billboard's U.S. Alternative Songs chart. The album ascended to #21 on the U.S. Billboard 200 chart and was certified "gold" with more than 500,000 copies sold. The song had initially appeared as a bonus track on Twenty One Pilots' second studio album, Regional at Best. The name Twenty One Pilots was derived from an Arthur Miller play called All My Sons, in which a World War II contractor knowingly delivers defective airplane parts, reasoning that fixing the problems would be too costly. The tragic result is the loss of 21 pilots. Apparently, the bandmates were inspired by the lessons of the story — to avoid shortcuts and always act with integrity. Hailing from Columbus, Ohio, Twenty One Pilots' early fan base was made up of Ohio State University students. Written by Tyler Joseph. 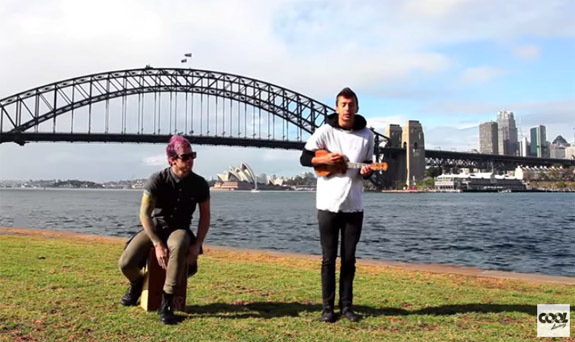 Performed by Twenty One Pilots. Will you take care of me?" The 15.99-carat "Jubilee Ruby" lived up to its pre-sale hype last Wednesday when it smashed a record for the most expensive colored gemstone ever sold at a U.S. auction. The fiery top lot of Christie's Magnificent Jewels sale in New York fetched an impressive $14.16 million. 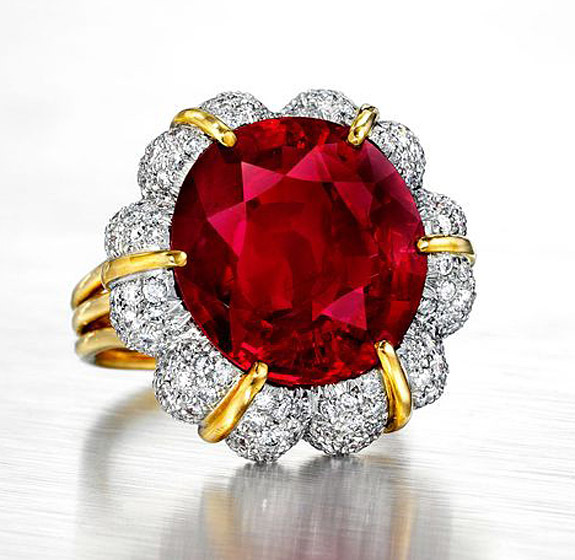 Billed as the most important ruby to appear at a U.S. auction in 25 years, the oval-shaped Burmese ruby is framed by round white diamonds in an 18-karat yellow gold and platinum mounting by Verdura. The ruby was mined in the legendary Mogok Valley of Burma, which is famous for yielding world-class rubies that boast the most desirable pigeon's blood color. The extraordinary, saturated red color is attributed to the high chromium content in the ground. The element also gives the gems of that region a natural fluorescence that makes the stone “come alive” and appear internally illuminated. “Top quality Burmese rubies of over 15 carats are an absolute rarity in the world of colored gemstones, and the record price of $18.3 million achieved for the 15.04-carat ‘Crimson Red Ruby’ at Christie’s Hong Kong in December 2015 exemplified the voracious appetite of collectors for these gems,” commented Rahul Kadakia, Christie’s International Head of Jewelry. While the Jubilee Ruby set a new U.S. record, the $14.16 million selling price is barely half the amount achieved by the 25.59-carat Sunrise Ruby, which established a new world record for the highest price ever paid at auction for a ruby when it yielded $30.3 million at Sotheby's Geneva in May of 2015. The other top lots at Christie’s April 20 sale included a 10.07-carat cushion-cut fancy intense purple-pink diamond ring and a perfect D color, flawless round brilliant-cut diamond weighing 40.43 carats. The purple-pink diamond ring, which carried a pre-sale estimate of $8 million to $12 million, sold for $8.84 million, while the flawless diamond fetched $7.22 million, also on the low-end of the pre-sale estimate of $7 million to $10 million. Credits: Images courtesy of Christie’s. 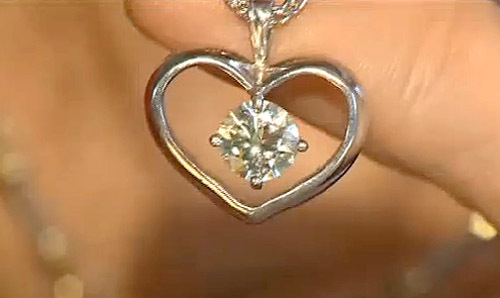 A Massachusetts woman, who accidentally threw away three valuable diamond keepsakes, is breathing a giant sigh of relief after donning protective gear and rooting out her family heirlooms at the bottom of a 5-ton mound of smelly trash. How the jewelry ended up in the trash is an all-too-familiar scenario. 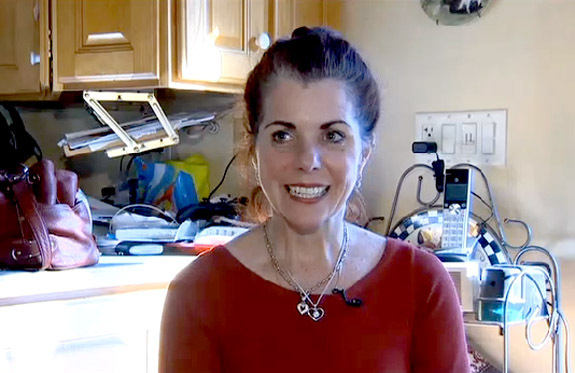 Cecilia Callahan of Norwell, Mass., had been cleaning her best jewelry in preparation for a special dinner with her husband, Joe, to celebrate their 11th wedding anniversary. 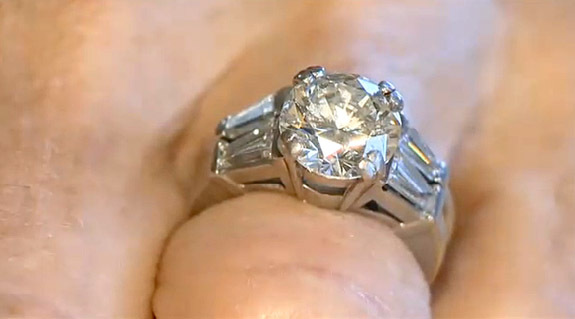 She placed her 3.1-carat diamond engagement ring, 1.75-carat diamond pendant and her grandma's diamond ring — a treasure she's worn for more than 40 years — in an ultrasonic cleaner. When the pieces were glistening, she pulled them from the bath, wrapped them in paper towels and set them on the counter to dry. The next morning, she hurried to clean off the kitchen counter before the trash collector arrived. She tossed the last few items — including the wadded-up, bling-laden paper towels — and ran the bag out to the curb. Two hours later, she realized what she had done. "I was having a heart attack," Callahan told Boston's NBC affiliate, WHDH-TV. 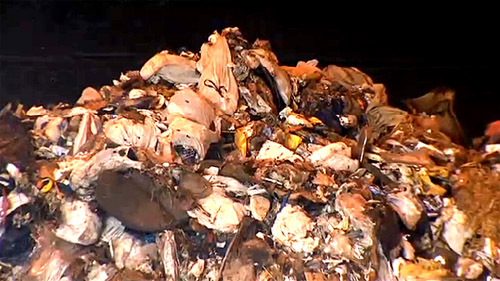 With the help of a neighbor, she and her husband contacted Waste Management and learned that the truck had yet to dump its load, so the truck was diverted to the nearby Braintree transfer station where 5 tons of refuse was spread across the floor of one of its bays. Aided by Waste Management staffers and outfitted in protective gear, the husband-and-wife team waded for two hours through a mountain of garbage bags. "Yeah, we were really in the trash," Callahan joked. But then Callahan honed in on a familiar trash bag at the bottom of the pile. "I pulled it out and it was mine," she said. "I was so excited." Sanitation worker Joe McCarthy was surprised by the Callahans' success. 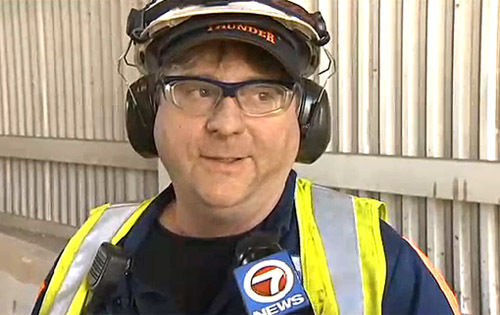 "It was like finding the Willy Wonka (Golden) Ticket," he told WHDH-TV. "You'll never find what she found." Boston's ABC affiliate, WCVB-TV, reported that the Callahans were so impressed by the Waste Management team that they returned to the transfer station a few days later with pizza and calzones for the staff. "They were so kind," said Cecilia Callahan. "They went above and beyond the call of duty. In this day and age you don't find so many nice people." Credits: Video screen captures via WHDH.com. 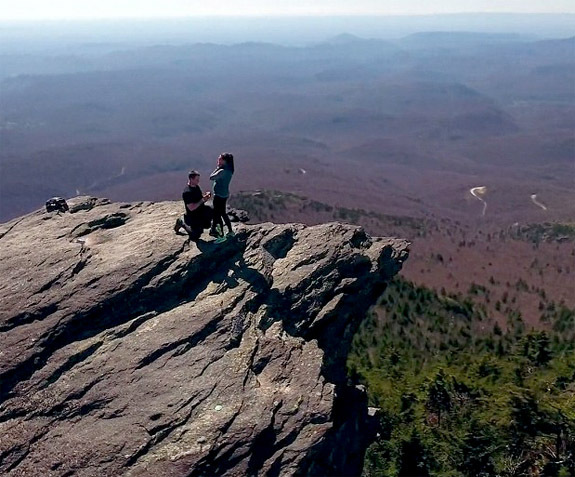 A North Carolina-based aerial photographer launched a drone atop Grandfather Mountain to capture a surprise marriage proposal — his own — from a spectacular vantage point high above the peak. 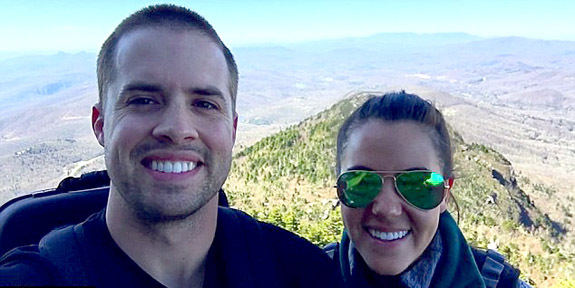 Jordan Nelson, the owner of Boone-based Nelson Aerial Productions, had convinced his girlfriend, Meghan Frye, 24, to hike with him to MacRae Peak, at the altitude of 5,844 feet. 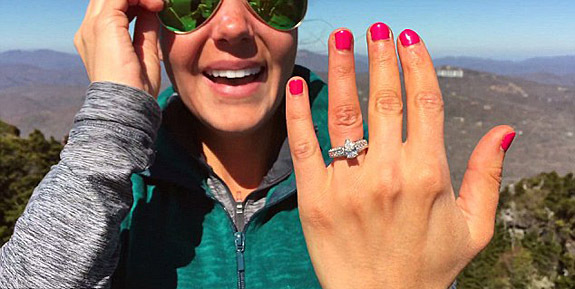 Frye had no idea that her boyfriend was planning to propose or that he had brought his equipment to film the exact moment he would pop the question. She was hardly suspicious because he shoots these sensational vistas for a living. 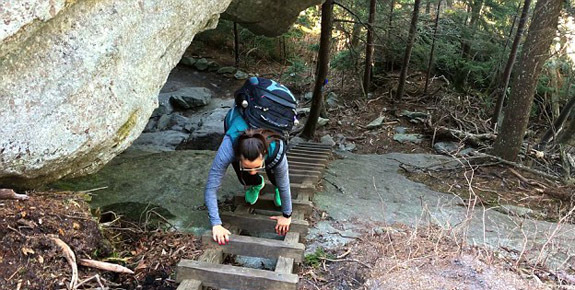 Nelson, 27, chose Grandfather Mountain in scenic Linville, N.C., for his proposal because exactly three years ago this is where the couple hiked on their first date. They also returned on their anniversary one year later. The drone's fabulous footage captures the couple from a bird's eye view as it circles the mountaintop. Nelson explained that the drone has an automatic setting that allows it to circle a specific point, in this case, the couple's exact location. Nelson also used his smart phone to capture his girlfriend's reaction from an intimate, up-close perspective. "It's been three years since we hiked in this spot," Nelson says in the lead-up to his proposal, and at this point Frye can hardly believe what is about to happen. She slaps him on the chest playfully and says, "Are you really? No you're not." Then Nelson gets down on one knee and continues his sweet proposal. "I want you to know that I love you," he says. "Will you marry me?" Overwhelmed with emotion, Frye accepts Nelson's proposal and obliges when he asks her to show the ring. "I was not expecting this," she says. Nelson's innovative, high-flying proposal has earned the attention of national and international media powerhouses, such as The Today Show, Good Morning America, Reuters TV and the Daily Mail. The aerial photographer is right at home filming in the rugged terrain of North Carolina. Just last week, he attended the Manhattan Film Festival for the screening of his work, Aerial Appalachian. The happy couple is planning to wed in the fall of 2017. The venue will be the Linville Ridge Country Club. The Proposal at MacRae Peak from Nelson Aerials on Vimeo. Credits: Screen captures via Nelson Aerials. 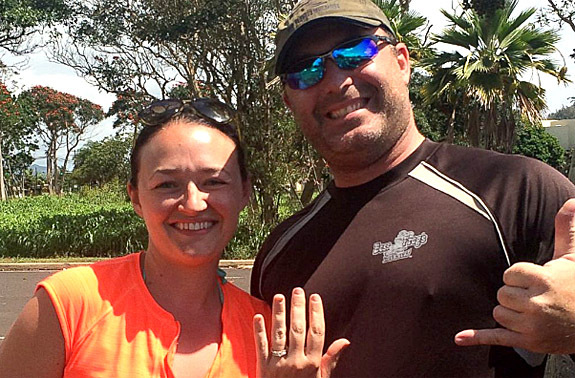 A New Englander's Hawaiian vacation went from glorious to disastrous — and then back to glorious — when a diamond engagement ring lost in the surf and presumed gone forever was miraculously spotted by another snorkeler only two days later. The hero of our story, Mike "Shay" Smith, said the brilliance of the gemstone made all the difference. While searching underwater for interesting shells, the glint of something unusual caught his eye. Smith intended to find the rightful owner by posting information about his precious find on Craigslist. 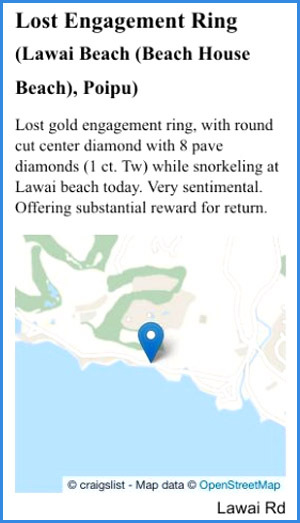 While viewing the Lost-and-Found section, he was stunned by a post from vacationer Laura Mitrowski, who was looking for a similar ring. Mitrowski enjoys the surf and loose rings have never been a problem in the past. Smith replied to Mitrowski's ad and asked her to describe any unusual details about the ring. When she told him that the band was cracked, Smith knew he had the right woman. 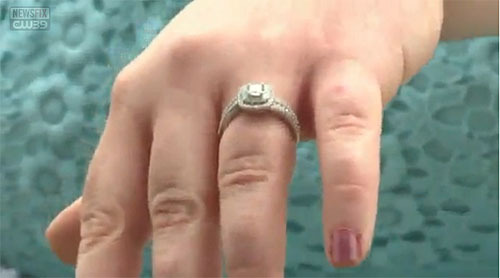 By the next day, the diamond ring was back on her finger. Mitrowski offered a $300 reward, which Smith refused, at first, and then accepted. Credits: Images courtesy of Laura Mitrowski. It's a little known fact that country music singer Lynn Anderson was nearly dissuaded from recording her signature song, "Rose Garden," in 1970 because of the diamond ring reference in the lyrics. Although Anderson really liked the tune penned by Joe South, her producer (and husband) Glenn Sutton felt it was a "man's song" because of the following line: "I could promise you things like big diamond rings / But you don't find roses growin' on stalks of clover / So you better think it over." 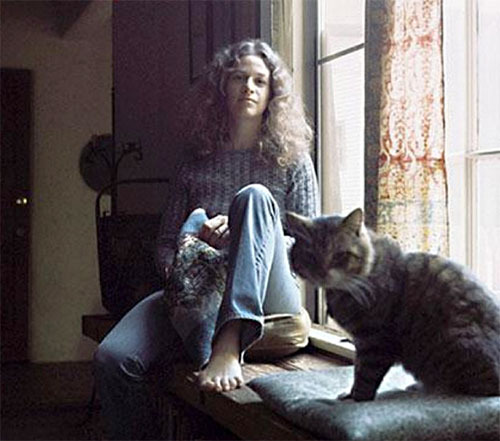 As luck would have it, Anderson had some extra time left in one of her studio sessions and Sutton finally agreed to record the song with an up-tempo arrangement accompanied by a mandolin player and a full string section. Columbia executive Clive Davis was so impressed with the results that he insisted the song be released as a single for the country and pop markets. The song not only topped the U.S. Billboard Country chart, but it also reached #3 on the U.S. Billboard Hot 100 and became a major pop hit internationally. It went to #1 in Australia, Canada, New Zealand, Ireland and Norway. "Rose Garden" is considered one of the most successful country crossover songs of all time. Anderson told the Associated Press in 1987 that "Rose Garden" was perfectly timed to appeal to the youth of 1970. "It was popular because it touched on emotions,'' Anderson said. "It was out just as we came out of the Vietnam years and a lot of people were trying to recover. This song stated that you can make something out of nothing. You take it and go ahead." The song's key line, "I never promised you a rose garden," essentially means "I never told you it was going to be easy." "Rose Garden" netted Anderson a Grammy Award for Best Female Country Vocal Performance in 1971, while South picked up two Grammy nominations, one for "Best Country Song" and the other for "Song of the Year." Born in Grand Forks, N.D., Lynn Rene Anderson generated crossover hits throughout the 1970s and 1980s, and continued to tour until her death in July 2015 at the age of 67. Singer Dolly Parton said at the time, "Lynn is blooming in God's Rose Garden now. We will miss her and remember her fondly." Check out the video of Anderson performing "Rose Garden" for a German TV show. The video, which features some unusual dance moves by the studio audience, has been viewed more than 1.6 million times. The lyrics are below if you'd like to sing along. Enjoy! Written by Joe South. Performed by Lynn Anderson. Credits: Screen capture via YouTube.